We are currently working towards our Active Flag in Rathnure N.S. Our Active Flag committee is combined with our Health Promoting School Committee as we work on most initiatives together. Staff v 6th Class Step Challenge – each year 6th class pupils take on the staff in a step challenge. Pupils wear pedometers for a week recording their steps every day. The following week, it’s the staff’s turn and whoever gets the most combined steps are the winners. The winners then choose a forfeit for the losers!! Lunchtime Leagues – we run various lunchtime leagues throughout the school year in Hurling, Football and Soccer. Teams are made up of boys and girls from different classes and matches are played during lunchtime. Older pupils act as managers for the teams. ‘Do your Talking as You’re Walking’ – we have introduced this into our playground to encourage pupils who, even if they just want to chat, they can do so while walking to make sure they are keeping active. Playground Game of the Month – we have a different playground game each month that pupils can choose to play on the yard if they wish. Our committee members teach the game to younger classes at the start of each month and encourage them to play it throughout the month. The game is displayed at each door to the yard as a reminder. 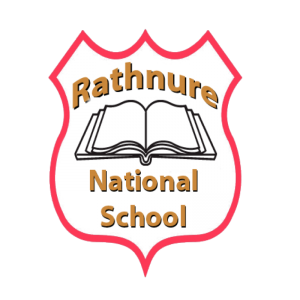 Rathnure GAA – we have a very strong school-club link with our local GAA club. We are very lucky to have access to the indoor arena which we can use for PE. Hurling 365 runs in the club, teaching skills to the pupils after school. Be Active After School – this initiative is run with the help of parents, providing a fun environment for 1st/2nd class pupils to learn basic skills. This runs during the summer term for an hour after school for one day a week and is free of charge to pupils. Enniscorthy Rugby Club – coaches from Enniscorthy RFC visit the school for a block of time each year to teach rugby skills to our senior classes. Super Troopers – All our pupils receive a Super Troopers journal which gives them Active homework each night. Pupils are encouraged to do the activity each night as part of their homework. Active week is a week of fun activities held in June, ending each year with our Whole-School penalty shoot-out final. We have a wide variety of activities throughout the week such as a disco in the yard, circuits and fun activities. We like to try out a new activity each year. In the past we have tried Boxing, Zumba Dancing and Tag Rugby. We also try to incorporate as much physical activity into our curriculum as possible during this week, for example, doing a Maths Trail or a Minibeast hunt in the school grounds. Active Homework is given throughout the week. It is always one of the most enjoyable weeks in our school.